South Bend Mayor Pete Buttigieg has endorsed the candidate he hopes will replace him at City Hall. At a press conference at James Mueller’s campaign headquarters on Monday, Feb. 11, the outgoing mayor made the announcement that he’s supporting Mueller’s bid for the city’s top job, according to 95.3 MNC’s reporting partners at ABC 57. Mueller, who announced he would seek the job last month, is the mayor’s former Executive Director of Community Development. 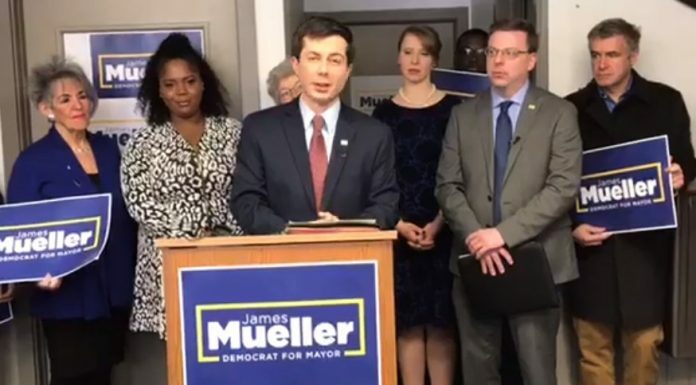 South Bend, IN – February 11, 2019 – Earlier today, surrounded by supporters at the Mueller for Mayor campaign headquarters, Mayor Pete Buttigieg announced his endorsement of James Mueller as the next mayor of South Bend. Mueller thanked the Mayor for his support. I SUPPORT The Mayor for President! How can I help?